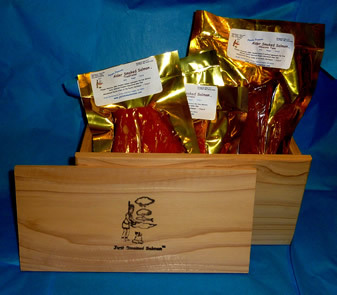 These Pacfic Northwest culinary products empower you to produce your own great Northwest cuisine anywhere in the USA. Have fun and don't forget to check out the hundreds of contest winning recipes! 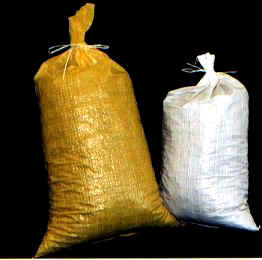 Whether you're smoking salmon, fish, meats or barbequing a turkey, seasoned gourmets know nothing compares to the naturally sweet smoked flavor of Western Red Alder wood chips and chunks. A rapidly growing trend among premier Northwest chefs entails the native tradition of marrying natural wood smoke flavor to seafood. Grilling salmon, seafood or other meats on 100% natural Alder, Maple or Cedar wood planks increases the food's juice retention while instilling delightful wood smoked flavor. 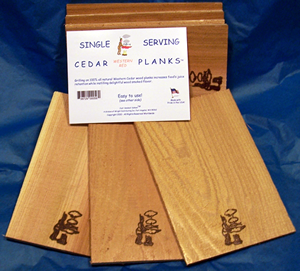 Easy to use instructions along with burn branded planks validating no risk of building code chemical treatments within, these natural flavor wood planks assure your grilled seafood will be succulent; and healthy! For centuries, cooking on natural wood planks has been relished by cooks of all cultures for adding flavor, retaining healthy juices and enhancing food's aromatic presence. The Just Smoked Salmon Just-EZ™ Alder, Maple and Cedar wood cooking planks return this palate pleasing tradition with modern flair and ease of use. 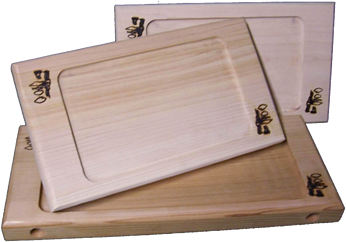 The revolutionary Just-EZ™ baking & cooking planks require no special tools! Handcrafted of premuim Northwest flavor woods, Just-EZ™ cooking & baking planks have been designed for years of average home use. Thrill and excite your guests with the delightful flavors and aromas these all natural wood cooking planks bring to your table! Whatever tantalizing gift ideas you create, rest assured, your brawny handcrafted Western Red Cedar gift box will be a cherished memento that can last a lifetime. It's a good thing too, since the savory gifts within won't! Whether you're a smoke-it-yourself enthusaist, or a corporate buyer searching for personalized gift ideas, you'll find these sturdy gift boxes a solid gifting solution.